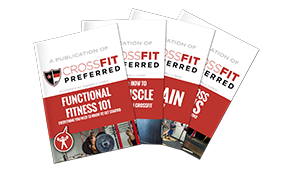 We at CrossFit Preferred offer level testing for our clients! For each test that you pass, you earn a shirt the same color of the level test. Clients must have completed and passed the Level 1 Test "White Band" for Level 2. Choose 10 out of 11 of these exercises. Must pass with an 80% rate. 1 minute rest between each exercise. 3 Parts to the Red Level 3 test. You must pass each part to move on. Clients must have completed and passed the Level 2 Test for Level 3. 3 Parts to the Level 4 Test. You must pass each part in order to move on. Students must have completed and passes the Level 1, Level 2, and Level 3 test to qualify for Level 4. 3 minutes at each station. Must score at least 1 rep in every section with a total of 80+ to pass to Part 3.